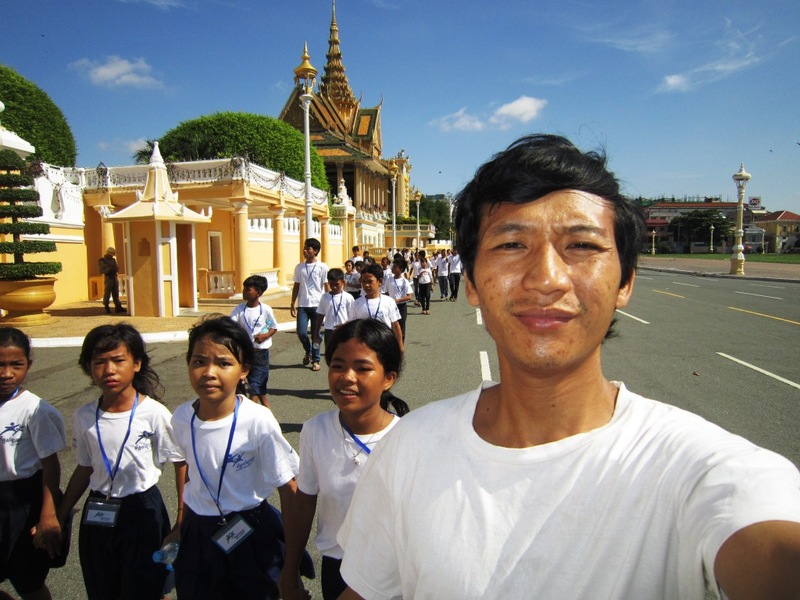 What happens when the Mith Samlanh students have a Grand Day Out (or more a Very Hot Morning) at the Royal Palace in Phnom Penh? Let Kesh and Thea, our communications volunteers, tell you in their own inimitable style…! ‘In spite of technical difficulties and scorching heat, a selection of Mith Samlanh students arrived at the Royal Palace for a tour of one of their city’s most important monuments. Excited students had gathered at Club Friends, where the younger children were lined up for their morning stretches. Unfortunately, the bus had broken down- although this made an exciting project for the mechanics in the room. There was no choice but to undertake the arduous journey on foot – an entire 200 metres! Having found an oasis of shade in the palace gardens, a Mith Samlanh instructor explained the history of the site and its cultural resonance. So informative was his explanation that a man in a red hoodie gravitated over to listen, having already snuck into the grounds by hiding in a cluster of Mith Samlanh T-shirts. He was promptly chased away. The group then explored the ornate buildings, peering in at the glittering throne room and examining traditional costumes in rainbow colours. 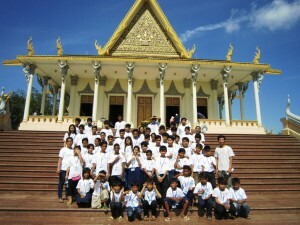 Once they had removed their shoes at the entrance, the students filed round the central golden altar in the magnificent Silver Pagoda. They were then free to wander around the gardens. After they had taken in the lotus-filled tranquility, some chose to visit the new photo exhibition, others flocked to the silk-making display.